Kimberly’s approach to therapy comes from a psychodynamic/relational perspective. She sees her work as being co-created with the client and is willing to put in the time and effort for long-standing, meaningful shifts and changes. She believes that we do what makes sense to us based on our history and it has, often times, become a way of survival. Through the process of therapy, clients have the opportunity to observe themselves and their mind in a non-judgmental space. They also learn to become more creative about how they might move forward and not just survive, but thrive. Kimberly believes her work with clients not only has the potential to transform them, but has transformed her over these 20+ years. She feels incredibly grateful to be a part of meaningful work with clients. Kimberly is an LPC and an LPC Supervisor. She graduated from Wheaton College with an MA in Clinical Psychology. She has been in practice for over 20 years. 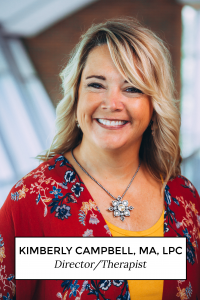 Kimberly came to SNU in 1999 and became the student counseling center director the following year. In 2012, when RENEW opened, she was named the Executive Director of RENEW. Her love for clinical work and training others to love this work, makes this the perfect fit for her. Individual, Couples, Family, Depression, Anxiety, Eating Disorders, Self Harm, Identity issues, Transitions, LPC Supervisor.